The man who would become Canada's first prime minister was born on the top floor of a three-storey brick building on Jan. 11, 1815. John Alexander Macdonald was only five when his family left Glasgow, Scotland for Kingston, Ont. Macdonald's father decided to relocate to Canada after a few failed business ventures, as explained by Macdonald's great-grandson in this TV excerpt. 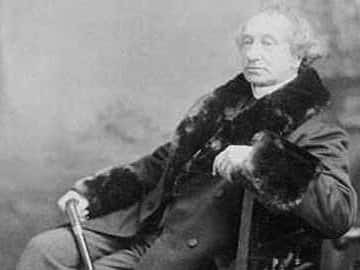 • In this clip, Hugh Macdonald Gainsford is seen raising a glass to Sir John A. Macdonald in the pub then occupying the ground floor of the building that was his great-grandfather's childhood home. Gainsford's mother was Isabella (Daisy) Macdonald Gainsford, whose father was Hugh John Macdonald, the surviving son of Sir John A. Macdonald. Gainsford was on a personal project as part of Canada's centennial celebrations in 1967. • Unlike his father, Macdonald would find success in both business and politics. Witty, tireless with a gift for organizing, Macdonald quickly rose to prominence. He was only 15 when he began articling for a local law firm. In March 1843, the popular lawyer and businessman was easily elected to the Kingston town council as an alderman. • His prosperous public life was marred by personal tragedies, which led him to seek solace in alcohol. In 1843, Macdonald married Isabella Clark, a cousin he had met on a trip to Scotland. But she became bedridden within two years of their marriage. They had two sons, John and Hugh. But the eldest, John, would die when he was just 13 months old. Isabella also died in 1857, after suffering an undiagnosed illness that left her addicted to opium mixed with wine. • In 1867, Macdonald remarried Agnes Bernard, the sister of his colleague Hewitt Bernard. In February 1869, Agnes gave birth to their only child, Margaret Mary Theodora, who was born mentally handicapped with an enlarged, deformed head. She died in 1933 at age 63. • Macdonald was devastated by the death of his son and his first wife. In particular, he never got over John's death and kept a box of his child's toys up until his own death. • Sir John A. Macdonald was born on the same day as another Canadian prime minister; Jean Chrétien, who was in office from 1993-2003.